Sri KrishnadevarayaAll the great dynasties of rulers of the southern peninsula have paid homage to Lord Sri Venkateswara in this ancient shrine. The Pallavas of Kancheepuram (9th century AD), the Cholas of Thanjavur (a century later), the Pandyas of Madurai, and the kings and chieftains of Vijayanagar (14th – 15th century AD) were devotees of the Lord and they competed with one another in endowing the temple with rich offerings and contributions. Sri Venkatachala Mahatmya is referred to in several Puranas, of which the most important are the Varaha Purana and the Bhavishyottara Purana. The printed work contains extracts from the Varaha Purana, Padma Purana, Garuda Purana, Brahmanda Purana, Markandeya Purana, Harivamsa, Vamana Purana, Brahma Purana, Brahmottara Purana, Aditya Purana, Skanda Purana and Bhavishyottara Purana. Most of these extracts describe the sanctity and antiquity of the hills around Tirumala and the numerous teerthams situated on them. One day, Rangadasa, a staunch devotee of Vishnu, in the course of his pilgrimage, joined Vaikhanasa Gopinatha, who was going up the Tirumala Hill for the daily worship of Lord Venkateswara. After bathing in the Swami Pushkarini, he beheld the lotus-eyed and blue-bodied Vishnu beneath a tamarind tree. Vishnu was exposed to the sun, wind and rain and was only protected by the extended wings of Garuda. Rangadasa was astounded by the wonderful sight. He raised a rough wall of stones around the deity, and started supplying flowers faithfully to Gopinatha everyday for Vishnu’s worship. One day, Rangadasa was distracted by a Gandharva king and his ladies. Consequently, he forgot to supply flowers to Gopinatha for Vishnu’s worship. The Lord then revealed Himself and told Rangadasa that He had been testing the latter’s continence, but Rangadasa had not been steadfast and had succumbed to temptation. However, the Lord accepted and appreciated Rangadasa’s devoted service to Him till then, and blessed Rangadasa that he would be reborn as an affluent ruler of a province and would enjoy the earthly pleasures. He would continue to serve the Lord, construct a beautiful temple with a vimana and high surrounding walls, and thereby earn eternal glory. Rangadasa was reborn as Tondaman, the son of the royal couple, Suvira and Nandini. Tondaman enjoyed a pleasurable life as a young man. One day, he set out on a hunting expedition on the Tirumala Hill, and with the help of a forester, saw Vishnu under the tamarind tree. Tondaman returned home, deeply affected by the vision of Vishnu. Tondaman later inherited his father’s kingdom, Tondamandalam. In accordance with the directions given by Adi Varaha to a forester, Tondaman constructed a prakaram and dvara gopura, and arranged for regular worship of the Lord (according to Vaikhanasa Agama). In the Kali Yuga, Akasaraja came to rule over Tondamandalam. 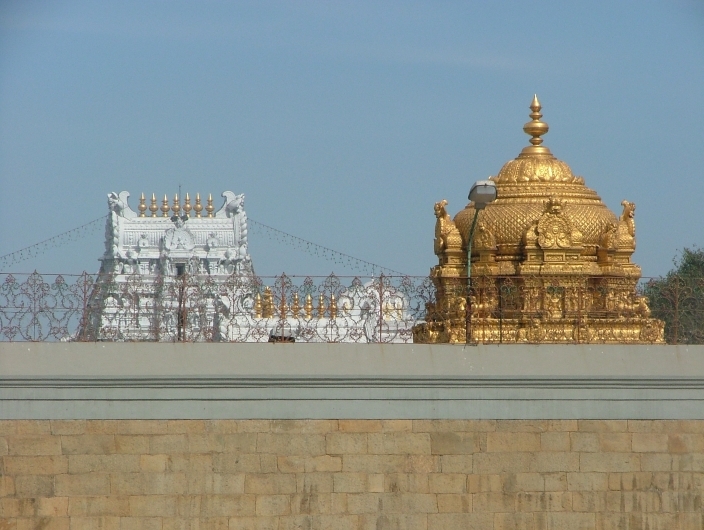 His daughter Padmavathi was married to Venkateswara. The marriage, officiated by Brahma, was celebrated with great pomp and splendour.